Each User Profile of Membership site by default includes Friends tab. On this tab you can check the list of your friends and add new friends. Also here you can accept or decline new friends, which want to add you to their Friends list, unfriend or unfollow some of your friends. Besides here there is the ability to send messages to your friends. Besides there is Followers tab, where you can check the list of people you’re following and list of your followers. Membership plugin by Supsystic is a great tool to find new friends and collect followers. How to understand what is the difference between friend and follower? Let’s explore this together! With Membership plugin you will provide your users ability to add friends or simply follow another users. If you add new friend and he will accept you, in this case you both will become the followers and friends of each other. 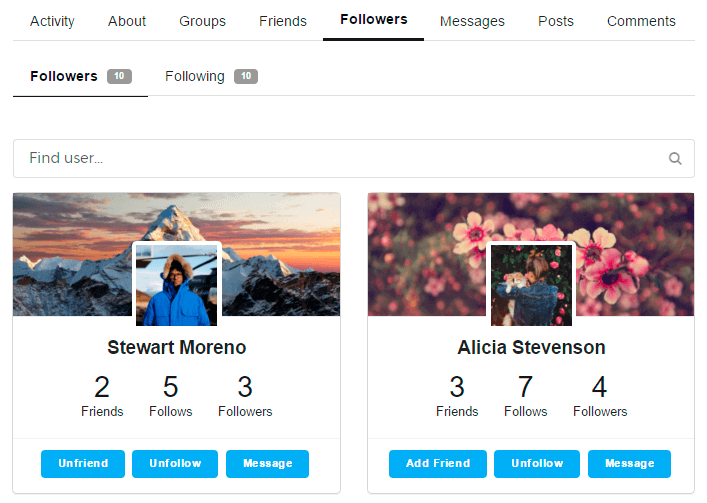 Both of you will be able to monitor the news on Activity page, publish posts, comment and like posts on Activity tab of each other. If you simply follow another membership user – you will be able only to monitor his posts on general Activity page of Community website. If you add new friend and he will decline your request – you will automatically become the follower of this user. This user will not receive your posts on Activity page in his personal account, but you will be able to view news of this membership user on your Activity page. Note, that all these restrictions for friends and followers also depend on Privacy settings of users accounts. 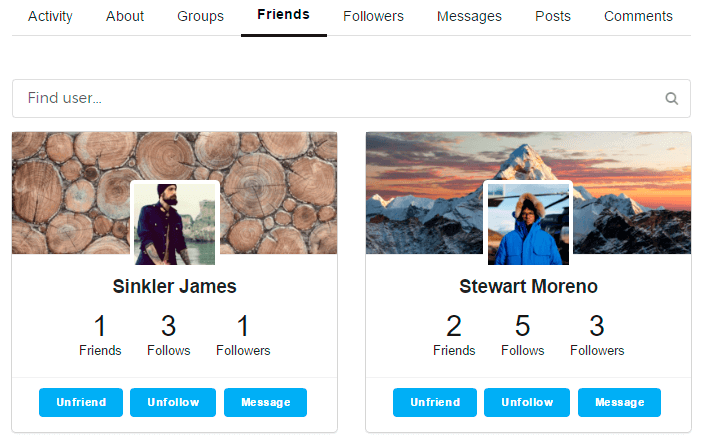 Membership by Supsystic allows you to disable Friends and Followers features on Main tab of plugin settings. On the Design Tab -> Members Directory you can also turn on\off them only for Members Directory.